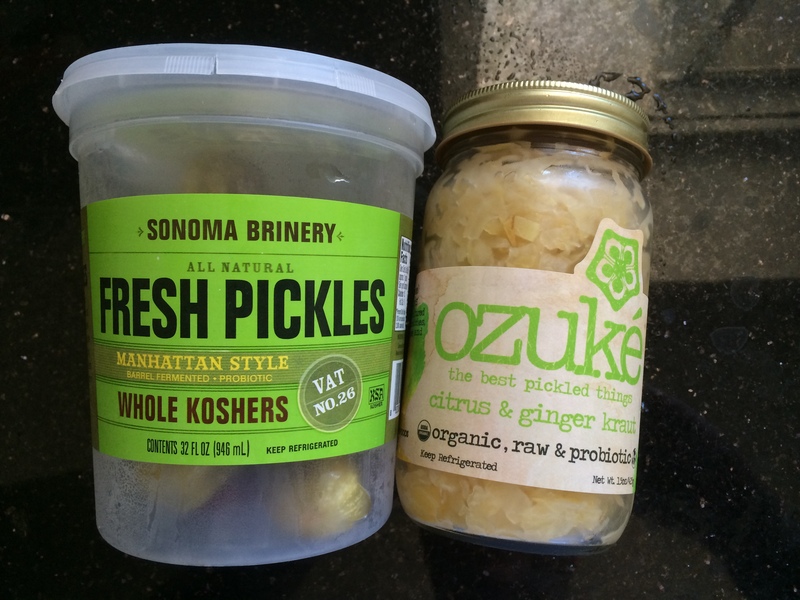 Today I’m going to talk about two very different pickles. The first are the Bread and Butter chips from Bubbies. Basically, I thought these were absolutely delicious. They had a light sweetness, not too cloying, with some nice crunch and mouthfeel. You can tell by the picture that I rapidly finished off the whole jar. 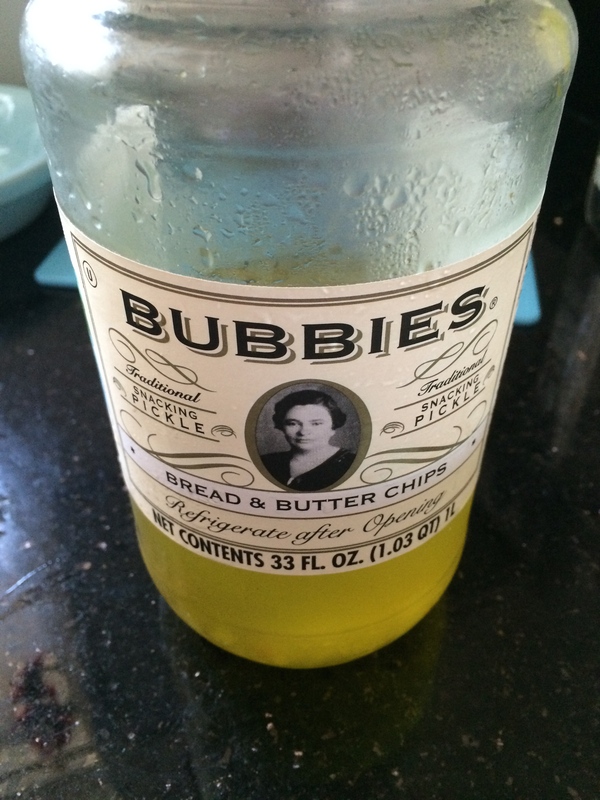 Definitely a recommend if you like Bread and Butter pickles. Bread and Butter pickles are cucumber slices, pickled with some sugar, onion, fennel and celery. Giving them a sweetness and mildness, contrasting with the ubiquitous dill. These would go good with a sandwich or when grilling. The story is that their name comes from the fact that when money was in short supply, you could put some of these pickles between some slices of bread, and they would work as a sandwich on their own. I didn’t try this with the Bubbies, but I could definitely see putting them between a couple of slices of pumpernickel, maybe with some brown mustard, and that could be a meal on its own. Although, I might like mine with some kettle cooked potato chips or something. The second type of pickle, is a mixed pickle. Giardiniera (which I can never spell right) is an Italian style of pickle. It usually cauliflower, carrot, and celery, often with red pepper, olives, onions, etc. pickled in oil and salt. This version from Golchin (a Persian food company) is pickled in vinegar with a little bit of ascorbic acid. 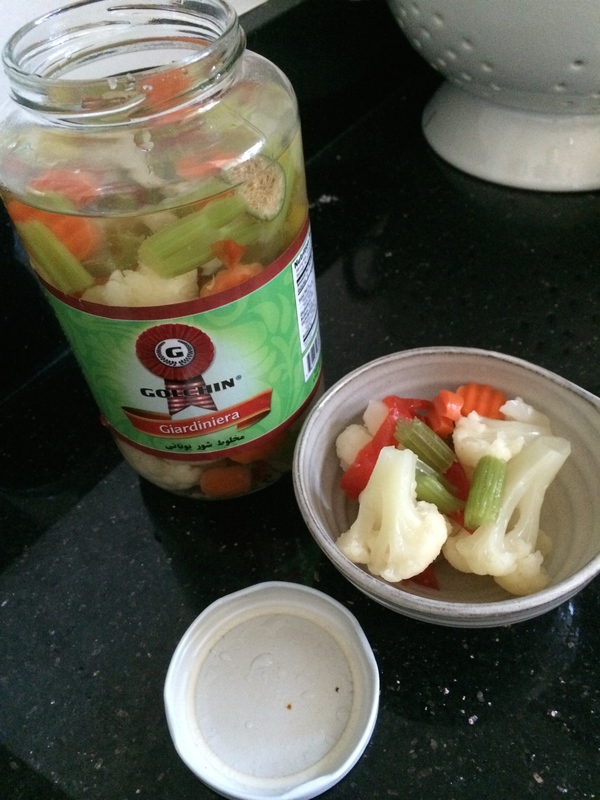 Giardiniera is often a little side dish with a lot of light Italian foods, or you can see it on a plate with olives. Sometimes the peppers in it are quite spicy. I am bit more used to the olive oil based version, which has a much richer flavor, although I guess the more traditional Italian version is with vinegar. Overall, the Golchin version was decent. Vegetables had a nice flavor, maybe a touch too salty. However, it seemed to be missing a bit of pizazz. I put some freshly ground black pepper on it, and it opened the flavor up quite a bit. It is interesting to me that this mix is very similar to the Persian pickle known as Torshi, which is maybe why Golchin is selling it. The whole big jar was only 3.99, so I think that is quite a deal, as in essence this serves as a ready made small salad type accompaniment for many meals. Again, I didn’t really love it, but as it is not as heavy as the olive oil based versions, it would be a lighter accompaniment for food. You could keep a jar in the cabinet, and break it out if you wanted to add a bit of something colorful to a plate. Overall, giardiniera is one of the most beautifully colored foods which can sit in a jar for years in the cupboard before you crack it open, so it deserves some credit for that all on its own. In terms of this offering from Golchin, it’s okay, but I am not in love with it. I much prefer some of the wide range of more spicy torshi type “mixed” pickles that Golchin sells. However, other people like more mild fare. So today, I’m going to review a couple of fermented pickles from some small production companies. Sonoma Brinery is located, surprisingly enough, in Sonoma County in Healdsburg. Healdsburg is a lovely town with lots of vineyards and wineries around. Their “Manhattan style” kosher dills are a nice, crunchy fermented dill. I’m not sure it really tastes quite the same as the dill pickles from the kosher delis or pastramis places of Manhattan, although that might be a trick of my taste memory. A lot of shops will sell full and half sours (more or less fermented), and I think the Sonoma Brinery pickles fall somewhat in-between. They also seem to have a slight bit more of a peppery hotness to them then I associated with a Manhattan style kosher dill. However, they are still really good and I would recommend them if this is the style of pickle you are looking for. They have a nice crispness, a nice little hint of spiciness, with the fermented tang and a tiny bit of the effervescence on the tongue. I’m looking forward to trying some of their other products. Ozuké is a brand from Boulder, Colorado. Zuke is a Japanese word for pickle, and I really like the concept of what they are doing. They are making traditional fermented foods in somewhat Asian style, with a sort of modern Western spin on them. For example, the idea of fermented cabbage with some citrus and ginger flavor is very Japanese. However, the more traditional version would be with napa cabbage flavored with yuzu. Here they are using Western cabbage and lemon. They produce a wide range of different interesting products which I have no tried yet. They have a pickled cucumber with green tea. They have a red cabbage kraut with orange calendula flowers with orange peel which sounds good and looks beautiful. They have a kimchi made from kale and collard greens (so hipster compliant). At first I was a bit disappointed in this particular cabbage and lemon mixture, mainly because I was thinking of some of the really delicious napa/yuzu pickles that I have had in Japanese restaurants. A lot of very Japanese sushi places around here will make there own home napa/yuzu pickles which are really exceptional. Western cabbage and lemon is much less subtle and much more flavorful, at first a bit over-powering. And the lemon after-taste is quite strong. Also, the kraut seems quite acidic, even more so than regular cabbage kraut. The flavors don’t blend together as well as I might have hoped, for example the lemon has such a strong note that it just sort of hits you early and then hangs out after the regular kraut flavor, which would be a mild acidity (fermented cabbage without the traditional Western flavorings like caraway and garlic is a bit bland and just acidic). I would like to ramp down the lemon and maybe ramp up the ginger. The cabbage had a nice chewiness to it. However, this one is starting to grow on me with time as I get used to it. It pair well with something like a grilled steak. The lemon flavor wouldn’t probably go well with most sausages, but a salted steak or chicken breast might be a good match. It would go well with a Japanese style grilled mackerel (saba shioyaki) and rice. I was trying to imagine a good vegetarian pairing, and it might be something with fatty richness but not much acidity on its own. Maybe olive oil marinated and grilled shitake mushrooms, something like that.